Sharon D Raynor’s review of South Vietnamese Soldiers: Memories of the Vietnam War and After is currently available as an advance article. 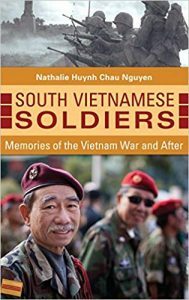 My book is about the men – and women – who served in the South Vietnamese armed forces (the Republic of Vietnam Armed Forces or RVNAF). I wrote it because South Vietnam and its soldiers have largely been forgotten, ignored or misrepresented in the vast historiography of the Vietnam War. More than a quarter of a million South Vietnamese soldiers were killed in action and nearly a million wounded. Their stories deserve to be heard and taken into the historical record. My book not only covers all branches of the RVNAF including the Women’s Armed Forces Corps but also deals with the aftermath of war for the South Vietnamese. Many of these former soldiers lived hard lives after 1975. Communist Vietnam did not recognize their service in the postwar era, and their military cemeteries were razed or left to decay. Former service personnel registered for re-education believing that they would return to their families after ten days but ended up spending years in the Bamboo Gulag, where an unknown number died. The government also interned women and children in re-education camps. Those who were able to do so escaped from Vietnam as boat people in the late 1970s and 1980s or left under the Orderly Departure Program. My book also covers the refugee experience, and the ways in which host countries have dealt with issues of loss, grief, and trauma among minority communities. Oral history is central to my book, as I used the method to create an archive of primary source material. My work is based on 54 oral histories of former servicemen and women as well as oral histories of their family members including spouses and children. One of the main outcomes of my work was the creation of a key new oral history collection at the National Library of Australia. These oral histories will be preserved for future generations and for a time when Vietnam can finally acknowledge this part of its history. Oral history involves interaction with people. When I conduct oral history interviews, I am listening to people reflect on and retell their lives. This can be particularly difficult for refugees and veterans, many of whom experienced internment and state censorship in postwar Vietnam. I am conscious of the fact that they are telling their stories as a gesture of trust. I would not be able to do my work were it not for the generosity of interviewees in contributing their time to my project. I am grateful for the opportunity of recording these lives and memories. The material in my book is genuinely innovative, involving the stories of men and women whose experiences and perspectives have seldom been heard, and certainly not quoted at length in a book. Most were junior officers – and some were in the ranks. Many were interned after the war and left their country as refugees. Having resettled overseas and reconstructed their lives, they have a double lens on the war. While I had prepared broad questions for interviews, my purpose was to enable veterans to speak about their lives, their perceptions of events, and what mattered to them rather than extract answers to specific questions. Veterans were conscious about the silencing of their histories, and provided me with additional material such as service magazines, unit histories, photographs, and copies of articles printed in local community newspapers or on websites. South Vietnam may have ceased to exist in 1975, but it lives on in the memories of those who served. Military service played a central role in the lives of these former soldiers. Servicemen and women, even after defeat, internment, exile, and the erasure of their history by the postwar Vietnamese state, remember their former country and their former service with pride.